I’d seen some weather maps during the Friday afternoon before we left on this trip, suggesting that a massive splodge of rain was heading for the approximate area of the central North Island. This was to be my first attempt at a club trip rated as medium-fit, and I had completely forgotten to bring my umbrella. How embarrassing. I wasn’t the worst off, though. Alistair forgot to bring his shorts. Location: Ruahine Forest Park, Purity Road-End. People: Captain (and gourmet chef) Alistair, Dirk, Paul and meeeee. Intended route: Camp at the Purity road-end on Friday night, then walk up past Purity Hut, Wooden Peg and Iron Peg. 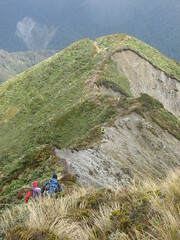 Turn South-East and carry on to Ohuinga, then head North down Broken Ridge, ending at Waterfall Hut for Saturday night. On Sunday, head up to Mangaweka via Trig Creek, back past Iron Peg and Wooden Peg, Purity Hut, and then out. Actual route: Similar initially, but due to some weather issues we picked up the track down a spur about half way between Iron Peg and Ohuinga, to Pourangaki Hut. On Sunday, we continued along the track up over Pourangaki, and down to Kelly Knight Hut for lunch, then back to the Purity road-end. There was no rain at all as it turned out, but the wind was a huge factor. We shared the van on Friday night with Spencer’s group, who were doing a medium-rated trip, and spent much of the ride trying to play a game that involved looking for horses, or pictures of horses. (I still don’t understand it, and everyone ignored my attempts to cheat.) There was some talk about either or both groups possibly walking up to Purity Hut on Friday night. Alistair however, who was already familiar with a very steep climb on the route, was adamant that everyone’s effort would be better spent getting a good sleep next to the road, which we eventually agreed to do. The forecast for the weekend had implied that there could be some complications with wind, and we were already experiencing hints of this. Paul and I tied the end of our Huntech fly down quite low to the ground in anticipation of conditions getting worse, but there were no problems overnight. The track leveled off, and the walk through the trees from there was actually quite relaxing. Meanwhile, I was discovering the burning sensation in my throat that resulted from the dish-washing detergent I’d left in my water bottle. It really put me off sipping water for a while. We reached Purity Hut shortly after 9am, under a cloud that allowed about 100 metres of visibility. The cloud didn’t lift at all, but I suppose the large, transparent window in the door of the long drop meant there could have been some very good landscapes to view in that direction if things had been a little more transparent outside. Either that, or the window was simply thanks to some DOC workers with a strange sense of humour. We boiled up a quick brew, and added another layer. It didn’t look as if the conditions were about to get any nicer. A comment in the hut book from a few days earlier mentioned that it had been snowing, against our expectations. Sure enough, however, the scatterings of snow after Purity Hut became more and more intense. The visibility became less and less to match it. By the time we reached Wooden Peg, snow was common in all directions, and it was becoming difficult to pick out even the immediately nearby features from the background. Continuing to Iron Peg, we began to encounter some harder, icier snow. By now, it was obvious that the weather was not appropriate for the initial plans of walking over the ridges all day, which realistically was about what we’d expected from the forecasts prior to leaving. 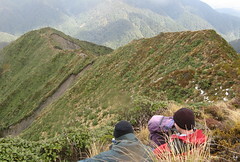 We began focusing on how to get to our destination of Waterfall Hut sooner rather than later. With the low visibility, being sure about the exact location of Iron Peg was difficult. In the end there was some guess-work involved as to exactly when we should turn off on a new south-east bearing, but we nevertheless managed to find the ridge heading towards the top of Pinnacle Creek without too much trouble. This was about the time when my experience of the trip was vastly altered, because things started to get very windy. I first remember noticing the wind at about the time that I was blown off my feet. It began to become noticeable as we dropped into the first major saddle on the south-eastern side of Iron Peg. For a few minutes it was quite amusing fighting against the wind, but after that I began to appreciate how difficult strong winds can really be . This was the strongest consistent wind I had encountered on a trip so far, and the first time a factor of the natural environment had invoked such a steady stream of four letter words as those that churned through my mind during the several hours we were at higher altitudes. Sometimes the wind would help to blow us up-hill, but I was personally beginning to feel quite discouraged at the amount of energy it was sapping, simply to avoid being blown off the steep side of the ridge. I soon learned that crawling up-hill and sliding down the other side, all the time keeping as low to the ground as possible, were very useful methods of movement. The wind was blowing consistently and quite relentlessly everywhere on the tops, and it didn’t stop. On several occasions when I lay over the ground for some shelter, it crossed my mind to envy the sleek alpine grasses that occasionally poked up through the snow, mocking me with their lack of need to actually go anywhere. I could have quite happily laid myself down, sheltered under my raincoat and soggy mittens, and stopped for a while. Fortunately for my own sake, logic quickly prevailed every time, and I convinced myself to get up again. It still didn’t stop the frustration of fighting up over the top of every small climb, only to realise that there was yet another saddle behind it in which the wind was likely to be even worse. There’s a trig somewhere in the middle of that ridge which isn’t marked on my map. I know it was there, because I had a good staring contest with a nearby rock as Alistair pulled out his map and consulted with Dirk and Paul. The forecast of the wind possibly being stronger on Sunday meant that we didn’t really want to go to Waterfall Hut any more. If we did, it would be necessary to return to the tops again to get out. The new plan was to aim for Pourangaki Hut, which would mean surviving the ridges for a little longer in exchange for being able to get out via the sheltered Pourangaki River the following day. I actually lied earlier when I said that the wind never stopped. For a moment, there was a sudden silence and a brief respite from the roaring gale. As I cautiously detached the edge of my polar fleece beanie from where it had uncomfortably lodged beneath my eyelids, I noticed the drop in wind had occurred at the exact time that Alistair’s boot-lace had come undone. I admired his skill in commanding the weather as he lent over to re-tie it, but felt a certain amount of resentment that he let the throttling winds resume as soon as he was done. We finally began to descend from the heights, finding a few small patches of sweet, sheltering Leatherwood along the way. With the gradual reduction in altitude, we came across a relatively protected place to stop for lunch at about 1pm, and took the time to sit down for a few minutes. After skittling over the top of a rather large land-slip, the gradient of the spur became steeper and slipperier. From that point on, I think everyone in our group gracefully contributed to the further erosion of the hillside. The bush became thicker, the wind-chill disappeared, and the air temperature steadily rose above what had, until then, been a staple 2.7 degrees Celsius. In fact, the downstairs climate was entirely disconnected from what we had experienced until that point. The lower end of that spur has a very nice small camp-site. It was only 2.20pm, but for a few minutes we toyed with the idea of simply going no further and setting up tent flies near the river. In the end, however, we decided to continue over the small swing-bridge to Pourangaki Hut. When we arrived half an hour later, it turned out to be in a completely sheltered clearing. There was no wind except what we could see in the tops of the trees. The Sun, which shone quite warmly, still had a good 30 degrees to move before it would be obscured. It was a nice time to sit outside, take in the surroundings, and dry out some damp clothing. Within a couple of hours, our outdoor slumber was interrupted by noises of more visitors coming down the hill. It turned out to be the first of Spencer’s group, whom we had earlier waved goodbye to at the road-end. They had also changed their original plans of getting to Kelly Knight Hut, and instead decided to come here. Perhaps they’d had a nicer time at higher altitude than we’d had, because at least a couple of them appeared very happy as they hobbled over the sunny clearing. The coincidence that both groups had diverted to the same place made the rest of the afternoon very enjoyable. For us, as it turned out, it was even fortunate. Spencer’s party had been overtaken early in the day by a large and slightly surly troop of older people, reportedly all wearing shorts that exposed their bare legs to the icy wind. They were also on their way to Waterfall Hut, and their main concern beyond anything else had been about who was going to be there when they arrived. If we had actually reached the place we’d been aiming for, it could have been very crowded. Dirk had a fire going by late afternoon, keeping us heated to a piping hot 17 degrees, or just over 20 for those on the top bunks. With 8 bunks in total there was plenty of space for 9 people, but Maggie (from Spencer’s group) opted to sleep outside under the veranda. She would have had a great view of the stars later on Saturday night. Having a trip leader who’s working his way through Gourmet Tramping in New Zealand (the book) is very beneficial. Thanks to Alistair’s organisation, we had a very filling course of Louisiana Jambalaya, followed by fruit cake for dessert. We shared some custard, because six litres of it was just slightly too much to comfortably consume between the four of us. Given the conditions of the weekend, it might have been that the amount of food we carried was all that separated the medium-fit group from the medium group. It was a smug feeling. With the winds forecast to get even worse on the tops, the plan for Sunday had been to follow the Pourangaki river to Kelly Knight Hut. Any alternative ideas had been merely an afterthought, until we actually woke up. Sunday was a relatively calm, clear day, perfect for climbing to higher altitudes. A couple of people in Spencer’s medium-rated group were still hurting a little from Saturday, and they decided to follow their original back-up plan and walk along the river (a 2-3 hour journey). Dirk was also keen to do some river walking, and joined them for this stage of the trip. Meanwhile, Alistair, Paul and I used the time to follow the track from the hut back up to the tops, and take in some scenery. The three of us left at 8am with an agreement to either meet the others at Kelly Knight Hut, or to exchange messages in the book. With the Sun now shining, Alistair had discovered that he could simulate his missing tramping shorts by rolling his stripy polypropylene leggings up to his knees. We climbed for about 15 minutes through the trees, and by then were able to stop for a moment and admire the surrounding snow-capped mountain tops over the valley that we had crossed blindly the day before, only just now becoming visible between the gaps in the branches. During this pause, Paul went to take a mouthful of water and was dismayed to discover that he had left his bottle behind. Fortunately there was a spare bottle buried in my pack, and we re-distributed the water that we already had. We continued to climb, taking in the increasingly clear views of the surrounding ranges. And in the end, we sat in a sheltered gully beside the untitled 1614 metre peak, 800 metres east of Pourangaki. For our efforts we enjoyed a sparkling morning panorama from Sawtooth Ridge through Broken Ridge and Rangioteatua, Mangaweka, Iron Peg, and ending with the clear view of a completely whitened Ruapehu in the far distance. Somewhere, approximately 1000 metres underneath us, six people had for some reason elected to wade through waist-deep liquid snow for 3 hours. Once again, it was a smug feeling. It was near the top of Pourangaki, on the way down, that Alistair’s emergency phone gained some reception and beeped at him. If anyone had contemplated staying at home to watch a certain rugby game on TV, it was now obvious they had made a superior choice to come out for a great windy weekend. The conversation about the sports news that raged in front of me didn’t last for long. It quickly morphed into a much more interesting anthropological debate about chimps, humans, and genocide. 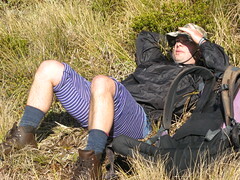 The others were wringing out their socks by the time we met them at Kelly Knight Hut, fifteen minutes before midday. Paul, was happy to discover that Dirk had rescued the water bottle he’d left behind that morning. The atmosphere around the hut made it a good place to be for lunch. We stopped for another half hour before heading out for the last part of the walk to the road-end, in one large group. Even the farm-land was a treat to walk through on such a calm, sunny day, although we made some accidental minor detours over the farm and Paul sustained an electric shock. We stopped in Mangaweka for ice creams on the way home. From there we left the Sun behind, and the weather became more dreary. The amount of water coming from rivers out of the western Tararuas implied that a torrential downpour of the weekend had probably missed us completely. I’m not complaining. Overall it was a good experience. For me personally, it was definitely one of the more memorable trips I’ve been on. In one respect it was disappointing that our original idea had to be down-graded from a scenic walk around the tops all weekend, but it was for all the right reasons. It certainly helped to be with three other people who weren’t just cheerful and good to travel with, but who were also experienced and knew this part of the Ruahines well. 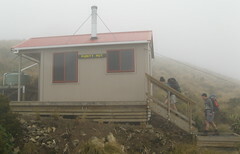 This entry was posted in tramping and tagged bagged:kelly knight hut, bagged:pourangaki hut, bagged:purity hut, change of plans, favourite, navigation, ruahines, tramping, wellington tramping and mountaineering club, wind, wtmc journal. Bookmark the permalink.